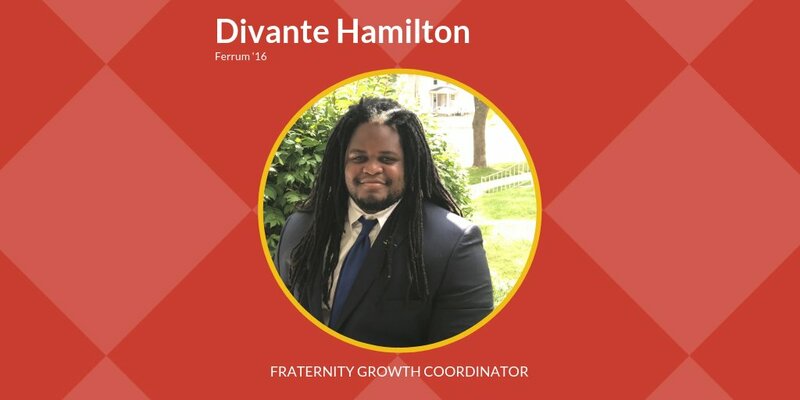 IOWA CITY, Iowa – The Delta Chi Fraternity has hired Divante Hamilton, Ferrum ’16, as its new Fraternity Growth Coordinator. Hamilton served Delta Chi International Headquarters (IHQ) as a Leadership Consultant since his hire in April 2017, assisting with numerous expansion efforts and providing invaluable guidance to chapters and colonies. Hamilton hails from Virginia Beach, Virginia, and earned a Bachelor of Science degree in Health Sciences from Ferrum College. He played college football as an undergraduate while also joining Delta Chi in 2014. He served as the “B” for his chapter and the President of the Ferrum Greek Council prior to his time with IHQ. As a Leadership Consultant, he served as the Resident Consultant at the Kent State University and University of Alaska – Anchorage expansions. Hamilton also assisted with recruitment efforts for the University of North Carolina – Chapel Hill expansion and has visited chapters in the northeast and Great Lakes region.